I was sixteen in 1944 and worked in the accounts department of a big firm of dry cleaners in Portsmouth. Due to staff shortages, I was often asked to serve in the shop and saw an amazingly different number of freshly-cleaned uniforms packed up and handed back to their interesting owners – at least twenty different services from all over the world. By 1944 the number of different American uniforms in and out had become very noticeable. At least once a week, from the end of the previous year, I attended Red Cross classes in the local Baptist Church Hall. This was the Hants 28th British Red Cross Detachment, of which I was a member. Our Commandant was Miss D. J. Hobbs, who had been a VAD in India during the First World War, and she did everything possible to make our attendance interesting. This included asking any army or navy doctor with half an hour to spare to come and talk to us – and help us through our First Aid and Home Nursing exams. I am glad to report that I took and passed every exam going. Small things in the eyes of the world, but a big thing to me. 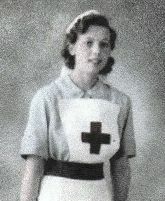 About 2 pm on D-Day Miss Hobbs came into the office where I was working and said that I was needed up at Queen Alexandra’s Hospital (QA), because there were so many wounded coming back from the beaches that they desperately needed help. I ran home to tell my mother, got my uniform and then rushed up the hill to the hospital. Another girl who I saw once a week at lectures checked in shortly after I did and we reported to Matron together. She checked our names and told us to go to this particular ward. It took us some time to get there because all the corridors were laid end to end with stretchers. Lorries were coming up from the dockyard so quickly that there wasn’t room for all the wounded. The army stretcher-bearers knew who was badly wounded and those who were less seriously wounded were put on the floor. When we got to the ward we were told to start cleaning people up, giving them drinks and things. Many of them were filthy – well, they were quite young and when you’re frightened you know what happens, you’re all messy and dirty – so the main thing was to clean them and bed-bath them. We didn’t have to treat their wounds or anything. If you took somebody’s filthy battledress off and found something bad, then you would call a sister. Mostly they were conscious but not talking much; they were mostly really, really tired and later on in the day we were told that they were the first exhaustion cases. A lot of them were so completely exhausted they didn’t care one jot what happened to them. They had been on standby since the day before. Some of them could speak, but when you are completely exhausted, not just very tired, when you are too tired to care about anything, you just want to be cleaned up and have something to drink. They weren’t hungry. While I was washing and cleaning up filthy and dreadful and horrible messes and giving out water and cold milk to people who were allowed such things, two sisters came round and asked if I would be willing to work in the German prisoners’ ward. They needed the same kind of help, but some nurses refused to go into their ward. These people were just lying on top of their beds in an assortment of dirty clothes. None of them was particularly badly wounded, but they were filthy dirty, absolutely stinking dirty, very white, unhealthy, unwholesome looking people. They had the dirty pallor of tramps, a horrible yellowy-grey unhealthy look. And nobody said anything. None spoke English to my knowledge, they just pointed. I sat somebody up – in those days you had feeding cups – and the smell was awful but by then it was too late to say you didn’t like it. The main thing I remember was them staring, a sort of a glazed staring. They hardly talked to each other at all, I hardly heard a word, just the odd grunt or the odd word; nobody had any brightness or any life. Everybody was lying down, nobody sat up unless we propped them up. It was very silent. I remember Win saying wasn’t it strange how quiet it was. I don’t really think I felt sorry for them and I didn’t hate them or anything like that. I know that when I gave them a drink or a wash or cleaned them up a little bit, there was a feeling of humiliation. Some of them were only kids, they weren’t really much older than me. One of the rules of the Red Cross is that you are there to help everybody. I’m glad I didn’t refuse to help those men. My small contribution to D-Day gave me a wealth of inspiration for the future. When I was old enough, I joined the Royal Navy as a full-time VAD, and was sent out to work in Hong Kong.